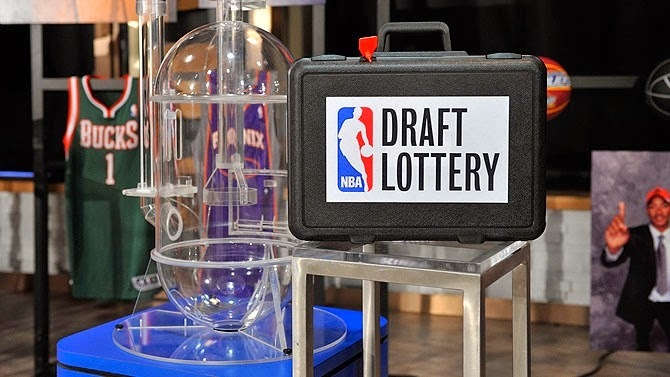 Tomorrow's NBA Draft Lottery will go a long way toward determining the future of the Pistons. Not that anyone should expect the team to win the lottery or select a franchise player--the Pistons probably already have one of those in Andre Drummond--but adding another quality piece to the Motor City Puzzle may be all that's necessary to build a long-term contender. Or not adding that piece if the fates conspire against the Pistons. Just as important will be how the Milwaukee Bucks fare, who are currently in the pole position to win the lottery with a 25% chance of receiving the #1 overall pick. The Bucks were terrible this season and could use the help that Andrew Wiggins (or someone else if they're not smart enough to take him) could supply, but their winning the lottery would be yet another bullet in the chamber against the Pistons. Since 2003, a team in the Central division has won the draft lottery five times. None of those players have worn a Pistons jersey. Lebron James (Cleveland), Andrew Bogut (Milwaukee), Derrick Rose (Chicago), Kyrie Irving (Cleveland), and Anthony Bennett (Cleveland) all went as the top pick in their respective drafts, and with the exception of Bennett, all have become significant factors in the NBA. James single-handedly ended the Pistons' title hopes when they had a potential dynasty. Rose won an MVP and when healthy runs roughshod over the league. Kyrie is still developing into a top-flight point guard and potential franchise player. And Bogut has been a defensive force for his entire career. Adding Andrew Wiggins into that pantheon only exasperates this hellacious decade for the Pistons. In that same time span, no other division has won the lottery more than twice. Dwight Howard and John Wall found their way into the same division in 2010, but only shared the spotlight for two season before Howard bolted for Los Angeles. Meanwhile, Lebron, Bogut, and Rose had a two-year span in the Central, and the Pistons are still dealing with Rose (kind of), Irving, and Bennett. If Milwaukee wins the lottery this season, the Central will have four #1 overalls in play for at least a year, and likely more if the Cavaliers are able to re-sign Kyrie at the end of the season. The only other team in the Central not to win the lottery over this time span is the Indiana Pacers. In 2008, the Pacers were gifted Roy Hibbert from bumbling GM Bryan Colangelo as a throw-in piece of a trade centered on Jermaine O'Neal and TJ Ford. They then drafted Paul George in 2010 when the Pistons took Greg Monroe. Though Detroit didn't fare poorly here, in retrospect that George dropped to #10 in the draft while Wesley Johnson and Evan Turner were taken in the top 5 was a stroke of luck for the Pacers. Meanwhile, the Pistons could very easily lose their pick tomorrow. Though not innocent in this potential loss, missing out on a top-10 pick in this draft will be significant. A rundown the potential draft picks available at #8 makes the mouth water: Noah Vonleh, Nik Stauskas, Julius Randle, Marcus Smart, James Young, Aaron Gordon. Though not all of these player are suitable for the Pistons' roster, missing the opportunity to add any of these players to your team could be devastating to a franchise consistently digging its way out of a hole. The Pistons' roster with any of these players could catapult them back to the playoffs and more importantly into contention in the Eastern Conference while missing out entirely might stifle the franchise's momentum. Tomorrow will tell. Cross all fingers. Knock on all wood.